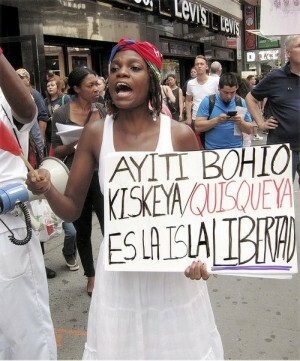 July 1 saw protests in Miami, Philadelphia and New York City against the Dominican Republic’s policy of deporting Dominicans of Haitian descent. The protest in New York, held in front of the Times Square Dominican Consulate, was called by two Dominican organizations: We are All Dominicans and Black Lives Matter in the Dominican Republic. The speakers connected the racist way Dominican immigrants to the United States are treated, noting that Dominicans in the U.S. are considered Black, to the racist way Haitians and the descendants of Haitians are treated in the Dominican Republic. In Miami, the demonstrations began with the chant “Enough is enough!” The Miami demonstrators also called the Dominican Republic’s deportation policy racist. “We will not stop until justice is done, and this is injustice,” North Miami Councilmember Alix Desulme said. The protesters later went to the Dominican Consulate in Miami, where they left a resolution demanding that the Dominican Republic change its immigration policy.